Otis Gibbs coined the phrase ‘there are only two things that matter in music, the artist creating it and the listener receiving it; everything else is an artificial filter’. Well there was no artificial filter in the Kitchen Garden Café this evening as Phillip Henry and Hannah Martin created the perfect union between performer and audience. Although this was the third occasion seeing the duo at the venue, the stars must have been aligned tonight to surpass the high standards from the previous dates. From a countless array of instruments, the Devon-based duo worked their way through a couple of sets exemplary in showcasing the multi talents of Phil and Hannah spanning extraordinary musicianship and purposeful song writing. The packed venue was testament to an act devoted to touring their show and being prepared for many repeat visits to grow an audience. They possess an incredible knack of leaving an impressive mark on the minds of gig goers. Specialist industry acclaim has shadowed the duo which has evolved to be the archetypical hybrid act in folk-Americana circles. 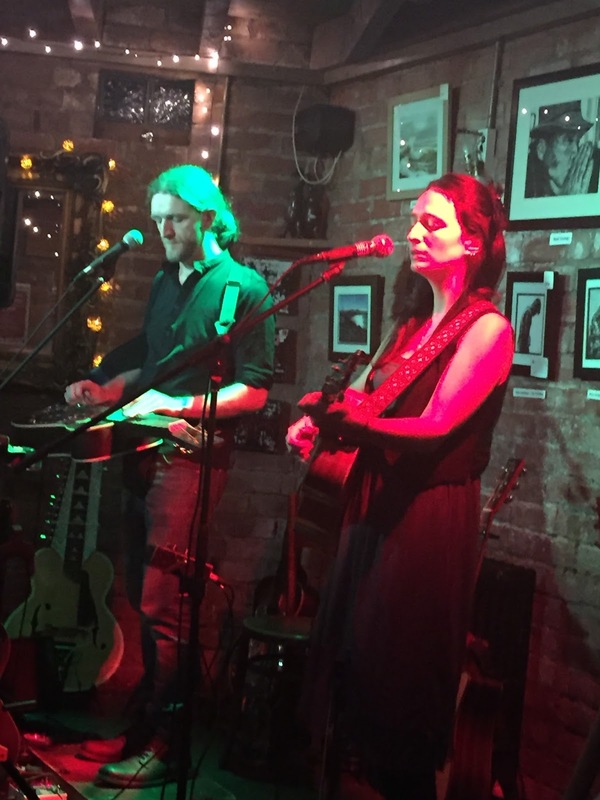 From the perspective of preserving the past through song and Hannah’s pristine vocal style, they have wooed the British folk community leading them to award winning status. There is little doubt that musically, one foot is firmly placed in the Appalachia Americana sound, not only in the prevalence of numerous slide guitars, banjo, fiddle and extensive creative use of harmonica, but also in the synergy their music has to the American roots movement. Although there are many intriguing facets to their act, Phil’s solo harmonica pieces seem to create an individual aura to themselves. The breath gasping ‘Underground Railroad’ has become a staple of a Henry and Martin show over the last couple of years and never fails to impress, even if you feel Phil needs a breather after evoking the train spirit that helped form 19th Century America. In the second set, Phil once again commandeered the harmonica to present ‘Keep Your Lamps Trimmed and Burning’. It was introduced as a tune tried out on a late night student crowd and it didn’t need much imagination to envisage even that audience mesmerised by the playing. While on the subject of Phil’s instrumentation, the unveiling of a 4-in-1 ultra-impressive Indian slide guitar was enough to have serious pickers drooling. Announced as one tricky in the tuning department, it was only used for one song and emanated a beautiful string sound, as you would expect part sitar. Elsewhere Phil majored on a pair of more conventional Dobro’s, while Hannah was equally as adept flitting between banjo, fiddle and acoustic guitar. 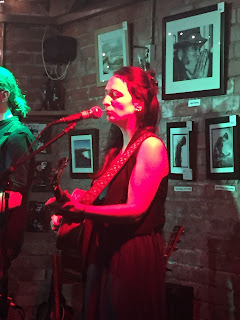 She proudly displayed a brand new guitar acquisition towards the end of the show and shared an excellent new song titled ‘Albatross’, which was the immediate result of connecting with this latest addition to the Henry and Martin extensive instrument collection. Primarily, Phil and Hannah were touring their latest album WATERSHED which saw the light of day last autumn. The opening track also had the honour of opening the show and several others were shared with this fixated Kitchen Garden audience. Phil introduced his personalised contribution to the album and also sang lead on ‘Yarrow Mill’. Hannah’s impeccable vocal performance peaked on ‘January’. Amongst the others to feature, ’Tonight’ was hailed as their Glastonbury headline tune, while ‘Taxis’ referred to their perpetual status as travelling musicians. Most of the rest of the songs were lifted from 2013’s MYND including the James Taylor cover ‘Close Your Eyes’ which is the duo’s usual encore number. ‘Silbury Hill’ opened the second set, which was brought to a close nearly an hour later with ‘The Nailmakers’ Strike’. 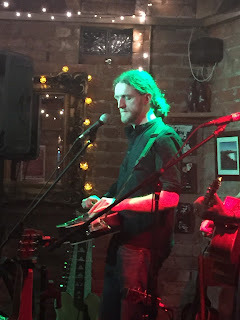 Hannah commented that it was extra special to play this song so close to the origin of the story which was based on a 19th Century march from Halesowen to Bromsgrove in support of beleaguered workers. Two further story songs from this album made an appearance during the show with Hannah informatively explaining the background of ‘Last Broadcast’ and ‘Song for Caroline Herschel’. Whether or not the term artificial filter includes those who relay the content and experience of live music, the sentiment of the quote existed while sitting barely five paces away from Phillip Henry and Hannah Martin while they shared the fruits of their craft. Connectivity was without blemish and for two hours in the Kitchen Garden Café nothing else mattered while a pair of exceedingly talented artists performed for this attentive listener.